Ancient Greeks invented the critical mind, perhaps the first giant intellectual step for mankind. That paved the way to move from proto-science to science. All early cultures had proto-science. Early Mesopotamians, Egyptians, Chinese, and Mayans collected and recorded data on celestial bodies and natural history, but they were unable to take the next crucial step of developing a theory to interpret the data. They were locked into the mythopoeic mind that interpreted all causation with anthropocentric myths.1 Hebrews mentioned ants storing food for the winter only as a lesson for sluggards.2 Greeks also had animal stories with human lessons, Aesop's Fables, yet they abandoned the mythopoeic mind for the critical mind in gradual steps, beginning with Thales (c.625-c.547 BC), from Miletos, on the Ionian coast of Asia Minor--he founded natural philosophy.3 Ionia was on the eastern periphery of Greek civilization, near West Asians, including the Persians. Natural philosophy began around the Greek periphery and only later entered its center, Athens, because Greeks in the periphery were aware of at least two kinds of thought-theirs and foreigners'. The impact of this juxtaposition is evident in the epics of Homer (700s BC), Iliad and Odyssey, both of which tell of struggles between Greeks and foreigners. Homer was a peripheral Greek, probably from Chios. However, Greeks not only fought foreigners, they also traded with them. Greek merchants learned that foreigners worshiped different gods and explained nature in different ways than the Greeks. Greeks realized that they needed to dig more deeply into causation if they wanted to learn which society possessed the truth. However, they could only have done so because they were self-governing, in small city-states. Miletos was a prosperous trading state, and Thales, a prosperous, widely traveled merchant. He concluded that the basic stuff of nature was water, the only substance known in antiquity as solid, liquid, and gas. If it changed from one of these states to another, perhaps it also changed into rocks. Milesians not only argued with foreigners, they also argued with each other. The next natural philosophers were also Milesions: Anaximander (c.610-545 BC) and Anaximenes (fl. c.545 BC), who appreciated Thales' intelligence, but nevertheless, developed arguments more compelling than his.4 Anaximander seems to have emphasized the process of mixing and separating rather than focusing on substance. Anaximenes thought that air was the basic substance, and that it changed form by either condensation or rarefaction. He borrowed and modified ideas from both Thales and Anaximander, realizing that both substance and process are important in nature. These Milesian philosophers' thoughts were more extensive than indicated here, but these examples show their quest for natural explanations rather than mythic ones. Greeks thus invented abstract thought, through a process which philosopher Karl Popper called "conjecture and refutation." Popper identified this process as fundamental to science,5 but not all pre-Socratic natural philosophers joined the debate. Pythagoras (c.560-c.480 BC), from the island Samos, just north of Miletos, founded not only a different tradition, but also a community. Samos had a tyrant, and Pythagoras fled to Crotona in Magna Gracia, on the southeastern coast of Italy.6 Pythagoras taught a natural philosophy that focused on quantities and patterns rather than on substance and process. He believed in harmonies in nature and thought mathematics was the key to finding them. When chemists determine that water is made up two parts hydrogen and one part oxygen, they vindicate the faith of the Pythagoreans. Chemical formulas are whole number ratios, and Pythagoreans believed all of nature could be expressed in such ratios. However, when chemists speak of whole-number ratios, they are speaking of elements such as hydrogen; Pythagoreans just had bare numbers in mind. That was reasonable in astronomy and music-celestial bodies were just bright dots in the night sky and music could be represented by dots on a page. Yet, neither in mathematics nor in real-world measurements do quantities always appear as whole numbers. There is a story about Pythagoreans, perhaps apocryphal, though it captures their bias. A Pythagorean measured the diagonal of a square having sides of one and discovered "irrational numbers." The story is that they agreed to keep this scandal secret, but one member told the outside world and was then expelled from their commune. The idea of scientific proof undoubtedly came from Pythagoras' concept of mathematical proof. According to tradition, Pythagoras developed the proof of the geometrical theorem that, in a right triangle, the two sides squared is equaled to the hypotenuse squared. He may also have "proven" that musical harmony is achieved when harp strings are in whole-number ratios of length. However, in some aspects of science, Pythagoreans depended on mathematical faith, not proof, as in their so-called "harmony of the celestial spheres." A Croton scholar, Alcmaeon (born c.535 BC), joined them and applied the Pythagorean notion of harmony in nature to medical thought.7 Alcmaeon got the idea that there are body "forces" (hot and cold, sweet and bitter, and so on) that are in proper balance with each other when one is healthy, and that illness occurs when these forces fall out of balance. After 500 BC, Greek physicians began to synthesize this idea, known later as the balance of "humours," with Egyptian empirical surgery and medicine, to create classical Greek medicine. Greek medicine became part rational-the balance of humours-and part empirical. The way rational ideas and empirical medicine came together is illustrated by physicians' concern that people live in healthy environments, eat healthy diets, and get adequate exercise. Physicians learned that living near marshes caused fevers (malaria) in summer, and that people get colds mainly in the winter. Some 60 brief medical works, written about 430-330 BC from a rational and/or empirical perspective, are known as the Hippocratic Corpus, because they were later attributed to Hippocrates of Cos (460-c.370 BC), a respected physician.8 One work, Airs, Waters, and Places, attempted to correlate diseases in a community with changing weather conditions (paragraphs 1-11) and identifying environmental factors that determine racial characteristics (paragraphs 12-20). Although the attempt was unsuccessful, it was a worthy goal that would be revived centuries later.9 Greek physicians used the stars to keep track of the seasons, but they did not consider stars environmental influences. Although they knew three kinds of parasitic worms live in human intestines,10 this knowledge did not lead to a theory of germs or contagion, and without such a theory, an environment vs. health research program could achieve little. They thought insect galls had medicinal value.11 Nevertheless, the Hippocratic Corpus represents a significant advance over the writings of early natural philosophers, who only reasoned from commonplace knowledge. The Corpus as a whole (but no individual treatise) meets a loose definition of science: it provides observational evidence, interprets the evidence, and draws conclusions based on the evidence. The wisdom of divine Providence...has made all creatures prolific that are timid and fit to eat, that they be not diminished from off the earth by being eaten up, whereas but few young are born to creatures cruel and baneful. The hare is so prolific, for that it is the prey of every beast and bird and man; alone of all creatures it conceives in pregnancy; some of the unborn young are hairy, some still naked, some are still forming in the womb while others are just conceived. But whereas this is so with the hare, the lioness, a very strong and bold beast, bears offspring but once in her life, and then but one cub: for the uterus comes out with the cub in the act of birth. This is the reason of it: when the cub first begins to stir in the mother, its claws, much sharper than those of any other creature, tear the uterus, and as it grows, much more does it scratch and tear, so that when the hour of birth is near seldom is any of the uterus left whole. It is so too with vipers and the winged serpents of Arabia: were they born in the natural manner of serpents no life were possible for men; but as it is, when they pair, and the male is in the very act of generation, the female seizes him by the neck, nor lets go her grip till she has bitten the neck through. Thus the male dies; but the female is punished for his death; the young avenge their father, and gnaw at their mother while they are yet within her; nor are they dropped from her till they have eaten their way through her womb. Other snakes, that do no harm to men, lay eggs and hatch out a vast number of young. The Arabian winged serpents do indeed seem to be many; but it is because (whereas there are vipers in every land) these are all in Arabia and are nowhere else found. Herodotos was a free spirit, but most Greeks felt strongly bound to their city state. The Greco-Persian Wars (490-479) prompted Greek states to unite and achieve a glorious victory. Fifty years later, these states polarized into opposing alliances and fought the destructive Peloponnesian War (431-404 BC). Thucydides (c.460-c.400 BC) was an Athenian general who arrived at a besieged city too late to save it from the Spartans, for which he was exiled.23 He then collected information from combatants on both sides and wrote his History of the Peloponnesian War. A famous catastrophe he described was the plague of Athens.24 Although Greece endured malaria and other endemic diseases, it had never experienced an epidemic disease until the Spartans invaded Attica in 430. Pericles' strategy was to let Spartans ravage the countryside while he kept the people safe within Athens' walls. However, with many people crowded together, an epidemic erupted. Thucydides' account of it was so detailed that some historians speculate he may have gained insights from reading contemporary medical writings, though no extant writings discussed epidemics. He was familiar with medical terminology. Doctors who stayed to treat the sick were unfamiliar with their disease, and doctors also died during the epidemic. It was contagious, had spread from Ethiopia or Egypt, yet the symptoms do not match any modern contagious disease. It died out or changed beyond recognition from Thucydides' described symptoms,25 unless the disease was accidental arsenic poisoning.26 In 429 the epidemic killed Pericles--a major blow to Athens, which finally surrendered in 404. Meanwhile, Leucippos (400s BC), probably from Miletos, originated the atomic theory of matter, which is known through his pupil, Democritos of Abdera (late 400s BC).27 This brilliant theory was slow to gain influence, because a world of randomness seemed incompatible with observed regularities in nature, such as the balance of nature. Close observations by modern ecologists reveal that animal population stability is illusory,28 but casual observations seem to indicate stability. In Athens, a contentious peace followed the Peloponnesian War, and politically conservative Socrates (469-399 BC) was a casualty. The aristocratic Plato (427-348/47 BC) founded his Academy in Athens around 385.29 He used the dialectical method of his teacher, Socrates, to organize his Dialogues, the most widely read work in the history of philosophy. Plato was also strongly influenced by Pythagorean mathematics, being convinced that numerical patterns provide a key to understanding nature. Some mathematicians and astronomers joined the Academy, though its psycho-social atmosphere was closer to a Pythagorean commune than to a modern university. When one left the Academy, one was prepared to be a member of the ruling class, which meant that one could answer any questions raised by the lower class. In Republic, Plato developed an elaborate metaphor of the cave, the purpose of which was to discredit sensory observations.30 If one learns that collecting data is pointless, then one gains an understanding of the world and society in the only reliable ways left, through mathematics and dialectics. One discusses possibilities and then develops a scientific myth that is as close to an understanding of nature as one can get. Popper claims that "historically speaking all-or nearly all-scientific theories originate from myths, and that a myth may contain important anticipations of a scientific theory. "31 Two Platonic myths contributed to a balance of nature concept, though that concept never achieved the status of theory. The natural history writings of the early Greeks having ecological significance were of several kinds: abstract speculations of pre-Socratic philosophers, a mix of speculations and empirical observations of physicians, Herodotos' folklore, Thucydides' Peloponnesian War, Plato's creation myths, and Xenophon's various writings. This miscellany would be of minor importance if it had not laid the foundation on which Aristotle, Theophrastos, and others built. Seen in that light, these early writings were very important indeed. 1. 1 Frankfort, Frankfort, Wilson & Jacobsen 1946. 2 Proverbs 6:6-9. 3 Diamandopoulos 1967b, Kirk, Raven & Schofield 1983:76-99, Lloyd 1970:1-23, Longrigg 1976, Sarton 1952:169-173. 4 Diamandopoulos 1967a, Kahn 1967, Kirk, Raven & Schofield 1983:100-162, Lloyd 1970:1-23, Sarton 1952:173-178, Tarán 1970a, b. 5 Popper 1962. Stannard 1965. 6 Fritz 1975, Guthrie 1967, Lloyd 1970:24-35, Kirk, Raven & Schofield 1983:214-238, Sarton 1952:199-217. 7 Kirk, Raven & Schofield 1983:260, 338-339, Kudlien 1970b, Lloyd 1991:164-193, Sarton 1952:214-216. 8 Joly 1972, Jouanna 2000, Karasszon 1988:65-70, Lloyd 1970:66-79, 1991:194-223, Phillips 1973:28-121, Salazar 2000b, Sarton 1952:348-388, van der Eijk 1999. 9 Sargent 1982, Sarton 1952:378-383. 10 Grove 1990:3, Penso 1981:45-48. 11 Böhner 1933-35:I, 118. 12 Gould 1989, Hartog 2000, James & Martin 1981:21-24, Myres 1968. 13 Forster 1942, Georgi 1982. 14 Bodson 1981:6, 8, 1998:68-69, Brown 1965, Furley 1972, Petit & Théodoridès 1962:197-206. 15 Sapp 1994:18. 16 Geoffroy Saint-Hilaire 1809:200-205 (from Jean-Marc Drouin). Bourdier 1972. 17 Bodenheimer 1954:179. 18 Milne & Milne 1966:65-66. 19 Pollard 1977:70. 20 Herodotos 1926-38:III, 108-109. Egerton 1973:325-326, Glacken 1967:40-41. 21 Hediger 1947. 22 Egerton 1973:326, Hughes 1975:63. 23 Ostwald 2000. 24 Thucydides 1996:Bk. II, 47-58, pages 118-123. Extracts: Clendening 1942:27-32. 25 Holladay & Poole 1979, Lichtenthaeler 1965. 26 Walker 1992:85-99. 27 Kerferd 1971, 1973, Kirk, Raven & Schofield 1983:402-433, Lloyd 1967. 28 Egerton 1973, Kricher 2009. 29 Annas 2000, Allan 1975, Görgemanns 1999, Lloyd 1970:66-79, Rauschenbach 2000, Ryle 1967, Sarton 1952:395-427. 30 Plato 1935-37:VII, 514-517. 31 Popper 1962:38. 32 Plato 1929:30b-d. 33 Plato 1962:320d-321b. 34 Glacken 1967:41-42. 35 Glacken 1967:120-121, Goldin 1997. 36 Anderson 1974, Sarton 1952:455-466. 37 Xenophon 1923:bk. 1, ch. 4, par. 2-18, pages 55-63. Glacken 1967:42-43. 38 Xenophon 1923:ch. 16, par.9-ch. 20, par. 29, pages 487-521. Winiwarter 2006a:193-194. 39 Xenophon 1925:ch. 5, pages 387-401. Bodenheimer 1952, Bodson 1978, Hull 1964, Petit & Théodoridès 1962:88. Ecology is the centerpiece of many of the most important decisions that face humanity. 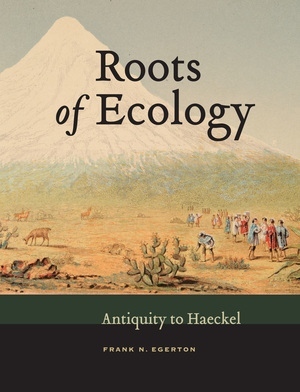 Roots of Ecology documents the deep ancestry of this now enormously important science from the early ideas of Herodotos, Plato, and Pliny, up through those of Linnaeus and Darwin, to those that inspired Ernst Haeckel's mid-nineteenth-century neologism ecology. Based on a long-running series of regularly published columns, this important work gathers a vast literature illustrating the development of ecological and environmental concepts, ideas, and creative thought that has led to our modern view of ecology. 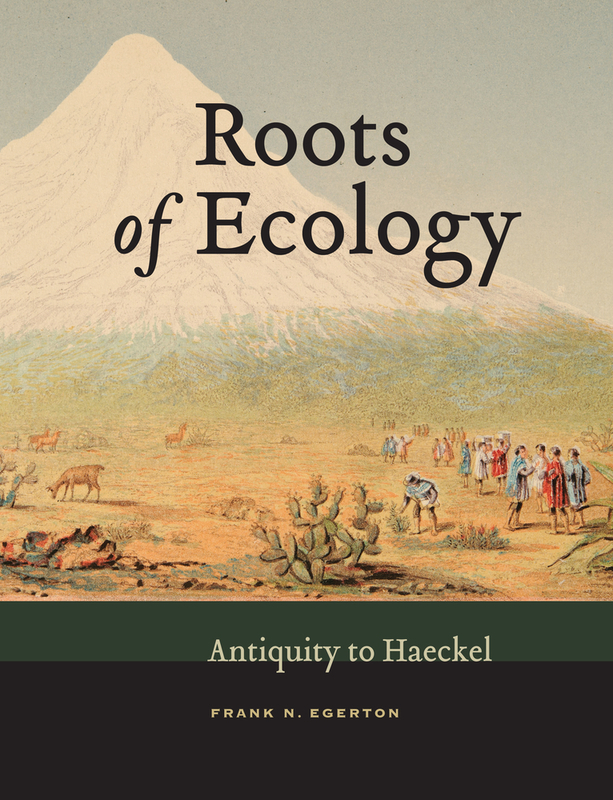 Roots of Ecology should be on every ecologist's shelf. Frank N. Egerton is Professor Emeritus in the History Department at University of Wisconsin in Parkside.